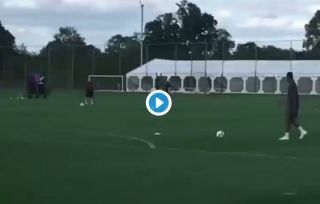 Arsenal striker Pierre-Emerick Aubameyang posted a cheeky goal video from training and tweeted it at his team-mate Emiliano Martinez. The Gabon international’s message is roughly translated as ‘don’t move’ – perhaps poking fun at the fact that the goalkeeper didn’t even react as Aubameyang’s shot flew past him. It certainly is a fine strike by the Gunners front-man, who has been in fine form since he joined the club from Borussia Dortmund in January. Aubameyang only has one goal so far this season, but looks sharp in training and will be hoping he can now net a few more against opposition ‘keepers, starting this weekend as Arsenal take on Newcastle.